The Suburban Wasn't Just A Significant Model For Chevrolet, It Was An Important Vehicle For The Car Industry As A Whole. Arguably It Was The First Sport Utility Vehicles (SUV), A Tough, No-Nonsense Load Carrier Featuring A Station Wagon Body On The Chassis Of A Small Truck. Actually Christened The Suburban Carryall – For It Could Pretty Much Carry Anything. 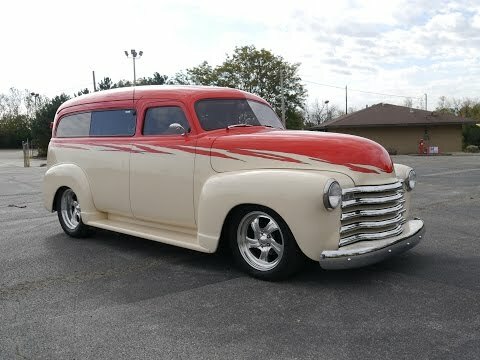 The Design Of The 1949 Suburban Would Go On To Inspire The Design Of The Chevrolet HHR Over Half A Century Later. Gorgeous Restoration Done To Show Standards, Driven To Many Of The National Street Rod Shows, Excellent Highway Cruiser, Please Take The Time To Review The High Resolution Photos And A Complete Video. Crate Chevy ZZ4 350 V8 Engine, Holley 4 Barrel Carburetor (Engine Is Custom Graphics Painted To Match The Outside Of Truck) Well Maintained With Synthetic Fluids.